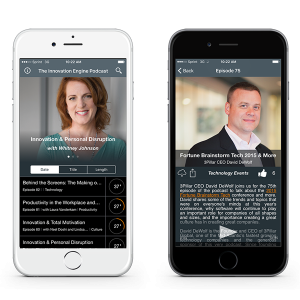 For a very special episode of The Innovation Engine podcast, we talk with some of the team behind the forthcoming iOS app for the podcast. We talk about where the idea and inspiration for the app came from, what the process of developing the app has been like since it was first conceived, and when you can expect to see it in the App Store. Guests on this week’s episode include 3Pillar’s Kevin Boyle, Matt Sich, Paul Axente, Chris Graham, and David DeWolf. Kevin Boyle is a Client Partner at 3Pillar with close to a decade of experience in the world of Product Development. Matt Sich is a Software Engineer at 3Pillar who’s referred to in the tech community as a “unicorn” – that rare breed of person who’s equally as comfortable designing as he is developing. Paul Axente is a UX Engineer at 3Pillar with five-plus years of experience in web design and user interface design. Chris Graham is a Client Executive in the Media & Entertainment space who joined us for the 78th episode of the podcast. David DeWolf is 3Pillar’s CEO. He has appeared on multiple previous episodes of the podcast, most recently to discuss the 2015 Fortune Brainstorm Tech conference.